There is a difference between psychological numbers and true values. Volume Profile show’s why the $5,000 value area is irrelevant and why it might surprise Bitcoin bulls and hurt Bitcoin bears. The $5,000 value area for Bitcoin has long been considered very important support and resistance level. Why? Why is that level considered so important to many traders, investors, and analysts? It has to do with psychology and familiarity. We use the number five in many, many forms. 5 bucks, 50 bucks, $1.50, etc. Yes, there are many numbers that we use frequently, but the number five is often used and understood as a ‘half way’ point in many of our thought processes. So it’s not a surprise that people would assume that $5,000 is an important level. But we need to use objective analysis to study support and resistance levels. To do that, one of the best tools in our trading toolbox is the Volume Profile (market profile, volume-at-price analysis, etc). Volume Profile is a part of what is known as Volume-At-Price Analysis (VAP). Regular volume analysis on a chart shows vertical columns that show how much of something was traded at a particular time. VAP shows how much of something was traded at a particular price. VAP shows where most of the participants has been and where people have bought and sold the most. These areas generate horizontal volume levels. Longer horizontal columns are called high volume nodes while very small and short horizontal columns are called low volume nodes. The way that traders and analysts view these levels is much like normal support and resistance – with one factor being different. High volume nodes represent strength and it is very difficult to move above or below those levels because they represent equilibrium. But, when prices do move above or below those nodes, extremely powerful moves can occur. The major gaps between high volume nodes, known as low volume nodes, act a sort of vacuum – prices get sucked into them and then to the next high volume node. We see this principle playing out on Bitcoin’s chart. As soon as Bitcoin crossed above the high volume node between the $3800 and $4000 value area, it exploded higher. And it is continuing to move higher. How high? To the next high volume node – which is inside the $6400 value area. It is extremely common for prices to experience stiff and hard resistance against the next high volume node. 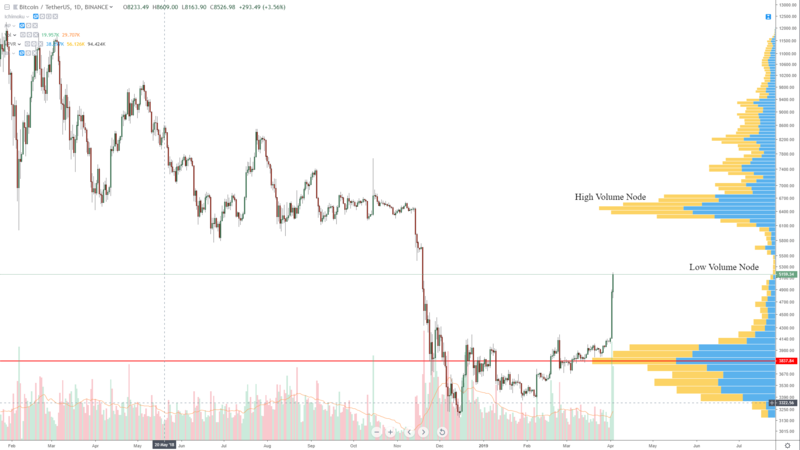 If you recall the price action of 2018, prices traded from February 2018 until mid-November 2018 with a floor price in the $6300 – $6500 value area. For nearly 11 months that $6300 – $6400 value area held as the major support zone. And so we should expect to see Bitcoin and the aggregate market pause and take a breath inside that zone. However, a pullback to test the $5500 to $5800 value area is extremely likely. Don’t expect price to just zip all the way up to $6400 from $3800 without some profit taking at the top. But that may not happen either. I have been impressed with the amount of BTD (Buy The Dip) that has been going on every since April 1st. The pullbacks are being bought up fast and strong.